First Alert Doppler 6000 is live. Alerting you up to six minutes faster than any other station. It’s completely controlled by our meteorologist for a more accurate forecast. Our radar can see through the storm, showing you exactly what’s coming, where it’s going to hit, how bad it will be and how long it’s going to last. The signal reaches out to 300 miles, seeing bad weather first, with more accuracy and with more detail than any other local radar. The higher resolution, dual pol, S-Band radar beams allows it to better see rain, hail, smoke and the debris field of a tornado. First Alert Doppler 6000 is the most advanced weather radar and only one of four in the world. It’s a dual polarization, high frequency, S-band radar… available to consumers for the first time ever. First Alert Doppler 6000 is live. While other stations share the National Weather Service radar to gather their forecast data, NBC 6 has the only live radar. That means we give you the information first, up to six minutes faster than anyone else. Our radar is completely controlled by our experienced team of meteorologists. We can speed up the radar sweep, scan particular sections of the atmosphere and therefore more accurately sense where dangerous storms may strike. Our six-minute advantage can help get the most up to date information available to make life-saving decisions for you and your family. When minutes count, count on First Alert Doppler 6000. This is the most powerful weather Doppler available and it can more accurately predict what’s in the air. First Alert Doppler 6000 can detect rain, hail, smoke, even debris lifted in the air by tornadoes. This feature allows NBC 6 to forecast the conditions you’ll be facing, right down to your street. It’s also capable of seeing through the storm. That means the signal doesn’t just see the initial line of storms, but also what’s behind it. This gives our weather team the ability to cut through and see inside the storm, showing you exactly what’s coming and how long the bad weather will last. What makes First Alert Doppler 6000 so unique? With a signal that reaches out to 300 miles from its antenna at NBC 6, we can better forecast where the weather Is going to hit, how bad it will be and how long it’s going to last. This will be especially helpful during tornado season and crucial during hurricane season. First Alert Doppler 6000 emits two different kinds of signals (dual polarization), sending information back instantly and accurately. This give us the ability get nearly precise rainfall rates, pick out areas of hail and see exactly when a tornado has touched down. Weather in South Florida can change minute by minute and can sometimes even be deadly. This technology is designed to keep you ahead of the storm and give you the precious time you need to be prepared, weather-ready and storm-safe. "This is the most powerful remote sensing weather tool South Florida has ever had," says Chief Meteorologist John Morales. "No public or private entity has ever counted on or provided such a sophisticated and powerful system." When there is a threat of tornado, First Alert Doppler 6000 can see if first, before any other radar in the area. Thanks to it’s state of the art S band, dual polarization Doppler radar system, NBC 6 meteorologists detect what precipitation or debris is in the air. It can clearly see rain, hail or, in the case of tornadoes, debris created by a twister on the ground. The most dangerous storms call for the most powerful weather tools. First Alert Doppler 6000 can see through the storm. This feature is instrumental when forecasting hurricanes. This radar can see the entire eye and it can punch through the initial wall of bad weather, seeing what’s inside and what you can expect. During brushfire season, First Alert Doppler 6000 can be an asset to South Florida as well as fire officials and government leaders. This powerful radar is able to detect smoke in the air. Our team can alert specific neighborhoods on the air quality. This benefit can help you prepare for your day if you’re planning outside activities that could be harmful to your health with poor air quality. 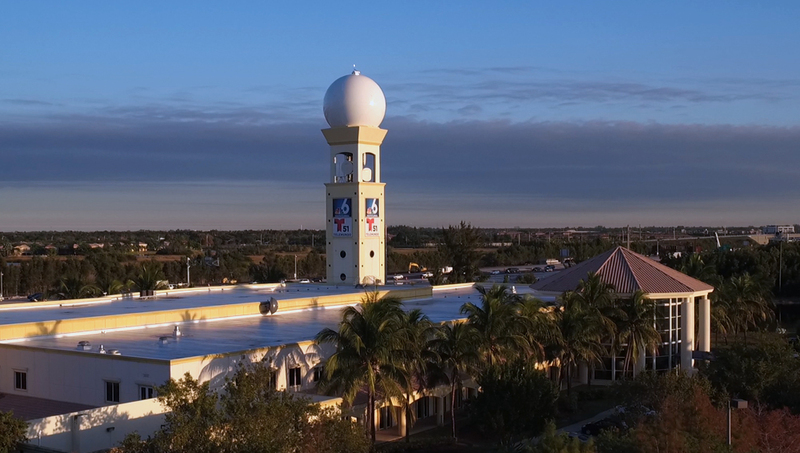 With the largest, most accredited and experienced team of Meteorologists in South Florida, NBC 6 and Telemundo 51 are uniquely positioned to leverage this awesome tool to benefit our audience on all platforms, on air, online and on mobile. 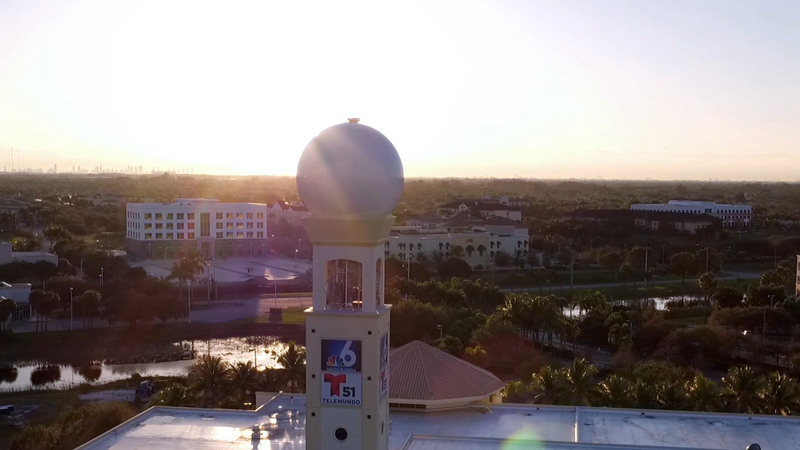 NBC 6 is committed to bringing you the most accurate weather information possible, and Doppler 6000 is just the latest investment we’re making into weather related technology to do just that. First Alert Doppler 6000 is here to serve our community and ensure that the First Alert weather team is your most-trusted source when it comes to severe weather.